Just What is Love According to Scripture? Peace – With God or Man? The bible – Word of God? I have only recently come to understand and appreciate just how much God hates opinions as they are used among Christians today. Our understanding of the place of opinions is a major Trojan horse of the god of Nice (The god of Nice is the topic of another article). I will attempt to show that opinions are one of the most destructive tools used by the enemy. It is a “big gun” that is used in his war against absolutes. Today’s Christians have a distaste for absolutes and is expressed by their high value toward opinions. Contrary to popular opinion, God does hate opinions. Opinions are truth or error waiting to happen. They are used as a substitute for truth. They keep us from discussing and pursuing truth. They encourage not making a choice or coming to a conclusion and therefore, not taking a stand. We seem convinced that truth can not be known. What God meant as a tool to bring us to the truth, men have validated as an end in themselves. “Everyone has a right to their own opinions”, so the popular idea goes today. There is only one “opinion” that matters. God’s – and His is not an opinion, it is all of reality. When we express opinions, we are only playing around with ideas rather than coming to conclusions. It seems that most do not even have truth in mind when they express their opinions. The church has embraced the false idea that everyone should have a right to their own opinion and nonsensical statements like “we will agree to disagree” abound and rule the thinking of Christianity. We can only agree that neither has enough evidence or authority to establish the opinion as truth. That is the only valid time when opinions can legitimately remain opinions – after they have been subjected to scrutiny and have been tested and no decision can be made. Decisions must be made where decisions can be made. Is it any wonder that Christianity and Christians and churches are in the state they are currently in when men are satisfied with opinions rather than truth? Unchecked and untested opinions are sucking the lifeblood of truth out of Christianity. Opinions and thought about any truth, are to be put forth in the interest of finding the truth in them. That is their purpose. They were never meant to be standalone entities. Each member of the body knows in part and sees in part. The role of opinions is to be a means at arriving at a wider perspective of the truth and more of the truth. Opinions are to be joined together as members share the part given by God. Collectively opinions will help us come to fuller truth. They were never meant to remain as opinions. It is an extreme wickedness to let opinions stand untested or to subvert the truth by ignoring truth because opinions exist. Such nonchalance about truth promotes only weakness and ineffectivness. That should be reason enough to test all opinions. We don’t discuss opinions properly because of the god of Nice. Investigating or questioning one’s opinions is somehow considered rude and outside the boundaries of “proper” conversation. Present day Christians are very thin skinned and easily take offense We are very diplomatic in our treatment of truth, God is not. There is no difference in allowing opinions than there is in adding to or taking away from the words of scripture. Opinions make all truths relative and irrelevant if allowed to stand unjudged by scripture and the Spirit. The god of Nice is the god of opinions which are not allowed to go beyond the opinion stage and become either rejected or accepted as truth. The God of Elijah asks “How long do you halt between two opinions?” The god of Nice demands that we halt between two or more opinions, the The God of Elijah demands the opposite. I am quite sure that most all were offended on Mt. Carmel as the fire came down and consumed all, and then Elijah did not have enough kindness to allow the prophets of Baal to repent. God judged their opinions and found them false. Their opinions caused their judgment by God. When Joshua allowed his opinion to rule and showed humanistic kindness to the Hivites and allowed them to live, God was not pleased and Israel has suffered because of it ever since. The “mean” God of Israel wanted all to be destroyed, the god of Nice did not. The god of Nice had his way with Joshua just as he is having his way today among Christians. Opinions are the favored tool. Truth is to be our anchor (Love rejoices in it 1 Corinthians 13:6, and it is necessary for worship John 4:23,24), and opinions are to give way quickly to truth even though the god of Nice raises it voice against it and demands that opinions stand and are sufficient. The God of Israel demands that we stand strong for truth and consider whether opinions constitute a part of truth. The god of Nice demands that we stand strong for niceness, truth is the casualty of the god of Nice, using opinions as its weapons to defeat or displace truth. One of the most wicked thing about opinions are that they are often used to destroy the work that the Holy Spirit has done among a group. After the Spirit has taught in a group, all someone has to say is, “That is just an opinion” and that will usually reduce the entire input of the Spirit from truth to nothingness. It becomes a mere opinion so no one has to take that truth seriously. Whether it is just the opinion of one or many, then those opinions need to be examined as to whether they are verified by scripture. It is not godly nor good to leave any thoughts considered as opinions without taking them to scripture. Opinions are meant to be a step to truth, not an excuse to avoid it, or to have so many versions of it so as to make truth meaningless or confusing. Being wimpy and wishy washy, not taking taking a strong stand on truth means that the person has not spent time with God. For once God has spoken, why must there be a reason for anything less than a strong stand? 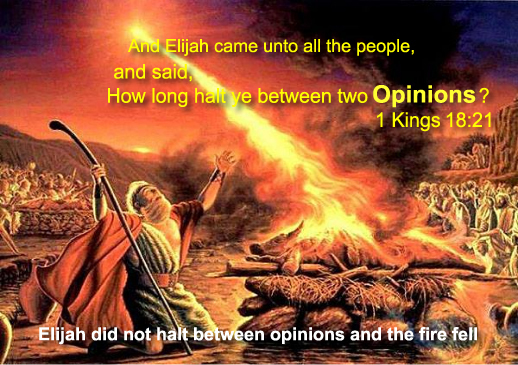 Elijah took a strong stand against everyone only because God had spoken. Another thing to consider. If one does not take strong stands, then why should God tell him anything? For me, it is an insult to God if I do not stand strong on what He has said. God never states His opinions nor does He have them. He only has the certainty of truth. Until truth becomes a certainty in the life of a person, he will not have authority or power. Those content with opinions will never have authority or power. And God will leave them to their opinions. There is no person in scripture who spoke their opinions with authority. And, as far as I can determine, no spokesman for God told their opinion without stating that it was their opinion, and not God’s. It was primarily those opposed to God which regularly spouted their opinions against God’s truth. Authority only comes by the God who speaks only truth and those who stand firmly on it and stakes their life on it. Truth is absolute, it is unmovable, can not be subverted. It is not to be treated as shaky or uncertain ground. Satan must give way to truth. It is no mystery that he is behind all opinion lovers who use them to avoid truth and coming to conclusions. In contrast, “All truth is relative” say the Humanists, and the church agrees. “Everyone has a right to their own opinions” say the Humanists, and the church agrees. Opinions are to have no life of their own except as it reveals or leads to the truth. However, the current state of Christianity is satisfied with and champions opinions and does not seem too concerned about whether truth is represented or not. The command to test all things is all but absent in the church and is frowned upon and taught against. If one comes into a discussion and starts to test the opinions, he is seen as a misfit, a troublemaker, or one causing dissent. “Why can’t he just get along?” How far we are from the Christianity that God instituted and gave procedures for! If testing appears at all, it shows up when discussing the main doctrines of Christianity, but even then mere opinions and traditions are given credibility and can shut out truth. Authority is based on truth and one’s singular declaration of truth. Opinions are the death of authority. Truth always begets conviction in the one believing. Truth is the strength of the conviction and the strength of believing. It is a rejection of all possible considerations or opinions that do not conform to truth. If one does not believe he has authority over sin in Christ Jesus, he will not have it, same goes for authority over demons and sickness and all devices of the enemy. When truth is not held in highest regard and is allowed to be slipshod, God’s purposes go undone. He only builds on truth. An opinion about the liberty found in Christ Jesus will avail nothing. Demons know that a person with an opinion about what Christ has done poses no danger to them or their kingdom. The prophets nor apostles never wavered in what they believed about the authority God gave them and knew they spoke for God. Jesus never expressed His opinion, the apostles did not preach their opinions. In the rare cases they did, they noted that it was their opinion – an opinion that was judged by the truth. We no longer believe that we speak for God because opinions have replaced truth. We do not speak for God when we speak mere, untested opinions. Yet, we chastise and criticize those who say they do (and satan has indeed been a great part in putting that idea into the heads of egocentric persons to discredit the truth that God does indeed speak through his saints). The entire testimony of the bible reveals the fact that God does indeed speak through His called out and chosen ones. If it were not so, there would be no bible, no Christianity. A double minded man is unstable in all his ways. James says it best and pinpoints the real devastation of opinions. Faith is based on truth, truth is the strength and soundness of faith. Truth does not cause us to waver, it is opinions on the truth and debate about the truth that causes wavering. Faith stands on the words from God and is totally convinced that His words are spirit and they are life and accomplish what He has determined they will accomplish. Opinions are nothing but wavering between two opinions. And today, saints still answer not a word, but continue in their halting between opinions and thinking that the halting is the height of spirituality and the practice of kindness. By validating opinions, we invalidate the mandate to make a choice between opinions that are in conflict. As long as we prefer to avoid the conflict that opinions can bring, we are doomed to continue to halt and be impotent for God. The God of Elijah demands a firm stand for truth. Opinions make that impossible. We do not believe the simplest of truths that Christ spoke of. We do not believe what He said about faith, we do not believe what He said about us, His body or the life He lives in us. We believe we are the quadriplegic body of Christ who is meant to be able to do very little. We do not believe that through Christ we can do all things. That may be largely due to the false saints that have taken those verses and used them after the flesh and thereby discredited the truth of them. We judge by the results man has had with them instead of the results God said they would have. We believe the evidence of man, not the evidence of faith or truth. Heb 11:1 The Humanistic god is firmly in control of the Christian faith. God is not believed, rather the evidence of our eyes which is produced by men without faith. All opinions on the matter are welcomed. But then why do most not demonstrate the authority God has given to His body? Cowardice, false humility, disobedience, unbelief and fear, and lying doctrines – looking to opinions instead of truth – those are a good start for the answers. There exists a popular misconception/opinion based on partial truth. It is that we are nothing, just a stupid sheep or a dry stick capable of little or no consequence. Such a view is valid as we look upon who we are in the flesh or who we were in Adam. But we are not to look at former truths, but new truths. We are now the “sheep” that Jesus leads into warfare against principalities and powers with the guarantee to demolish them. We are the dry stick, the dead rod, but we bud just like Aaron’s rod because we, like it, are filled with the life of God. It is keeping both of these truths in mind as we go forth that begets power and safety. But we must go forth in the power of the spirit, and not the working of the flesh. But the opinions of many prohibit the bible truth and its power and victory. Those that manifest authority are those who boldly declare what God has given them, They make no defense or excuse, they stand their ground unmoved by tears or by coercion or concerns for acceptance or being misunderstood. Their opinions have given way to absolute truth. They know Whose reputation they are concerned with. Those who exercised authority in the bible were told many times by God, Fear Not, only believe. If fear is present we can almost be sure that the charge God gave us is valid. While the context speaks of some specific things I believe that it applies to all truth. Men and saints alike will despise you for speaking with all authority. “who is he to think he is always right? Why is his opinion better than another?” It is because most rebuking and exhorting has been done based on opinions instead of truth, that the entire benefits of rebuking and exhortation have fallen into disrepute. Yet, Christians refuse to test all things, to find out whether the opinion expressed was indeed only an opinion or represented God’s truth. Such refusal to test is cowardly and is disobedient to the demand that we test all things. It produces impotence in the body. We must decide what we believe and why we believe it and then not turn back. Those who speak with authority move by truths, not opinions. They know their strength and that power is not their own and do not look to their own power “I can do all things through Christ which strengtheneth me.” (Php 4:13) is their surety. They entertain no opinion other than that. They know they have been given power and their duty is to use that power to demolish principalities and powers. The battle with the flesh will be ongoing and will continually test us as to whether we will follow the flesh or obey the Spirit. Battling with the flesh does not indicate spiritual immaturity or unreadiness. It is only an additional and common way to exercise our dominion over our flesh and reckon it dead in Christ. It is essential that we confront and destroy every opinion that denies or modifies those truths. The one who walks in authority cares not what men may think or say or what their judgments are. They are like Paul and Jesus. It is not that they arrogantly disregard the input of others, regardless of their tone or intention of the input, but rather take all remarks to the throne of God and let Him verify or dismiss the charge. Being wrong to them is no small thing. The thing they most fear is misrepresenting God and His Kingdom and His Christ. They are eager to repent and welcome challenges to their words or authority. Ego and justification are their hated enemy. The testing of all things is their friend and the source of their safety. The one satisfied with opinions has no deep respect of the truth nor a true fear of God. They feel OK with adding to or taking away from the truth and its intent. They talk foolishly and loosely. They think little of expressing an opinion, it is a small and risk free thing to them. The church, like the world, has fallen prey to the notion that truth can not be known as a certainty and that opinions are adequate. They for some reason think that truth is meant to be hidden and subject to conjecture. They do not believe scripture which says that Holy Spirit will guide us into all truth. Stubborn is a favorite word that error prone people like to use against those with valid positions. Stubborn can mean the same thing as “standing firm”, Immovable”, “standing for truth”. Standing immovable and firm is commanded in scripture. It is critical to victory. Standing immovable in a position on truth and faith is the one thing that must be done after all the armor is on. Persons sloppy or lazy with truth will call such firm standing, stubborn, because it changes the discussion from matters of truth, to matters of character. Yet, other Christians will not question the accusation, nor determine whether the person is standing firm on truth, or he refuses to look at the truth and holds on to his opinion in the face of all evidence against it. That is the ONLY time when someone can be said to be stubborn. To not take a stand, is to be double minded, halting between two opinions. God says, “Let your yea be yea and your nay be nay”. It is black and white, and not grey. Nuances, yes, but indecision, no. Let Christians no longer be duped into letting anyone use the term stubborn to describe another without questioning its accuracy. I would guess that most who are reading this are reading it to find out my opinion. Please do not do that. My opinion, your opinion, matters not. Only the opinions that match God’s truth matter. In all matters of opinion, we must lean totally on the Holy Spirit to separate the precious from the vile. We are to let one speak, and the others judge a righteous judgment. That is all I am asking. If there is a righteous judgment against what I have said and will be saying, you owe it to me and to the body of Christ to show forth the errors or omissions. I have provided the ability to offer your opinions on any topic on this site. It is an opportunity for you to speak, and to let others judge. That is the only way that what each of us sees and knows in part will get shared and the precious separated from the vile. Truth is an uncomfortable thing. It challenges our opinions and our egos. It cares not for opinions about the truth. When opinions are valued, truth is compromised and eventually becomes impotent. It is suggested that you read them in this order because some thoughts and themes are based thoughts developed in previous articles.